Carry On – The Rise and Fall of Simon Snow is a ghost story, a love story, and a mystery. It has just as much kissing and talking as you’d expect from a Rainbow Rowell story – but far, far more monsters. Carry On is the LGBTQ Harry Potter fanfiction-spinoff-novel that I never thought I needed. Okay, I know I’m late to the party. Rainbow Rowell released Carry On a couple of years ago and even if I read Fangirl and moderately enjoyed it, I never bothered to read Carry On…until I chanced upon a discounted copy during the Big Bad Wolf Books Sale. It was a beautiful Rainbow Rowell paperback at 60% off! What’s a girl to do? It would seem that Carry On and I are fated to meet, so I picked it up, read it and never looked back since. I can now happily confirm that I am, at present, a veritable SnowBaz trashcan. I never expected to like Carry On. I didn’t expect to fall in love with the characters and how they were written. See, Carry On is supposed to be a fanfiction/caricature of Harry Potter. It pokes fun at tropes and twists cliches and is almost self-deprecating. 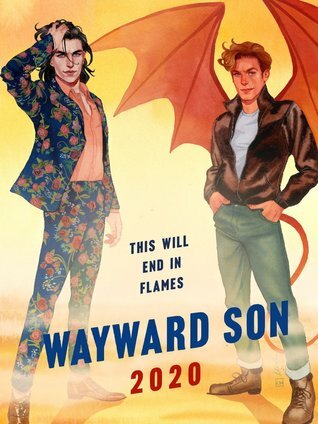 But in true Rainbow Rowell fashion, the characters still remained nuanced and deliciously human (well, one of them is probably a vampire, but you get my point). In this story, Simon Snow is our Reluctant Chosen One. He’s not the best magician, but he’s obviously charming, in a rough-around-the-edges-yes-I-was-raised-in-various-orphanages kind of way. Penelope Bunce is The Smarter Sidekick, the updated Indian version of Hermione Granger. And Baz, oh my, Baz is The Brooding Anti-hero who also happens to be secretly in love with the protagonist. I have to admit that one of the reasons why I never read this book earlier is that I wasn’t very comfortable of the M/M pairing. I grew up in a culture where gay relationships are often oversexualized and treated as taboo. Genuine love and affection between members male species? You don’t see, hear or read about those often where I’m from. The hesitation was somehow culturally ingrained in me and it was this kind of wall that prevented me from appreciating M/M pairings in contemporary literature. Simon and Baz have such an interesting, complicated dynamic and I enjoyed every single one of their interactions. I love how Rainbow Rowell showed their personalities through quirks and characteristics. And I love everything about Baz. I’m not going to spoil much about him but I gotta say, he’s yet another sweet baby bat that must be protected at all costs. Maybe the only downside to Carry On is that it kind of left a lot of plot holes, as far as the magical lore is concerned. I wanted to know more about their world, the situation, the supporting characters. The novel was meant to be more character-driven, so there were times when the plot, setting and worldbuilding kind of felt like an afterthought. Still, I enjoyed this novel immensely. Who would’ve thought that Cather’s fanfiction would be a real book? Carry On was such a treat and I highly recommend it to everyone. 4.5 brilliant stars for this baby! Don’t have a copy of Carry On? Get it from Book Depository— they ship FREE worldwide!